From time to time I like to visit Skyrim. I've been going there for about 2 years - completed the main quest a year or so ago, and since then go back to undertake a side quest or, more often that not, just wander around admiring the scenery. Of course my character is now reasonably levelled-up so wandering around is not quite as perilous as it used to be; interesting rather than terrifying. 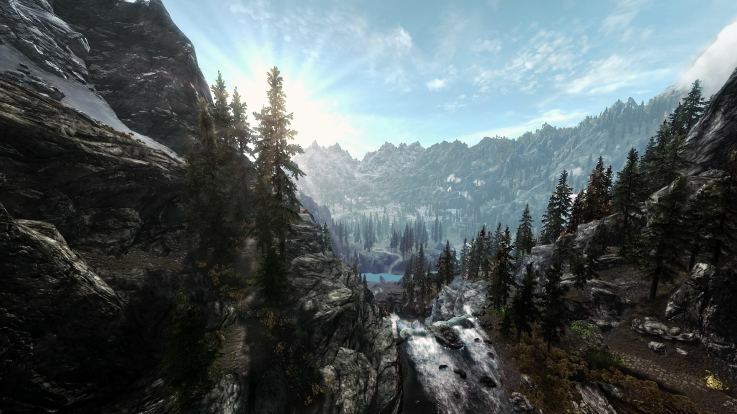 But the thing I've noticed in recent months is that I have memories of being in places in Skyrim that, subjectively, feel completely indistinguishable from memories of being in real places in the real world. In other words the quality and character of the memory - the sense of having really been there - is no different when I recall, say, standing on the porch of Dragonsreach Hall looking South toward Throat of the World mountain, as when I remember looking down toward the Cumberland basin from the south footpath of the Clifton suspension bridge. For me this is a new experience. I've been playing (and sometimes coding) video games since that meant batting a pixelated ball from one side of a low-res monochrome screen to the other on home built 8-bit micros in the 1980s. I have fond memories of playing the first generation Alone in the Dark ~1993 on a 386 PC, with my 5 year old son - but my memories are of the experience of playing the game with Tom, not of actually being in that haunted house. More recent games on the Xbox 360, with graphics I would have had difficulty imagining 20 years ago, have not had the same effect of creating such compellingly real memories for me. So what is it about Skyrim that is making these memories feel so real? I think there are several factors. The first is that the scenery is so breathtakingly beautiful, which means you really do want to just stop and stare for awhile. Second, and equally important I think, is that this is not some imagined alien landscape. It is decidedly Earth - a cold Northerly Earth certainly, but the fells and mountains, the lakes and forests, the grasses and especially trees, are realised so accurately you can identify whether it's a birch or an oak. Third, the landscape is in constant motion - so the grasses sway in the wind, the brooks gurgle and splash and insects flutter. Wait a little longer and you realise the day is passing from afternoon to dusk, the sky turns golden in the sunset, then to night. A star spangled and moon-crossed night sky then rewards the patient (and the brave - this is a wild and dangerous place), following by a glorious sunrise. And there is weather too. Rain, which splashes delightfully on the lake, occasional thunderstorms (learn the power and you can call them up! ), and snow blizzarding in the mountains. 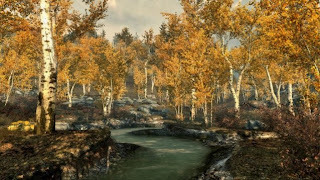 In case you can't go there yourself watch this YouTube movie: Skyrim - landscapes and scenery. All of these are I think important cues in making the experience, and hence the memory, feel so real. But I think there is another factor, which is that my journeying through Skyrim is part of a narrative which connects places with events, quests and discoveries. So the memorable places are those I have arrived at following some perilous and occasionally epic trail, with multiple trials on the journey, Or they are places I have discovered offer safety and refuge; places to return to after days questing in the wilderness. Perhaps the depth and intensity of the experienced narrative somehow makes up for the limitations of the sensory experience? With only 2D vision on a flat TV screen and stereo audio, and nothing at all to stimulate the rest of the considerable human sensorium, it seems incredible that such a weakly immersive experience - compared to being in real places - can create subjectively comparable memories. Since thinking about these memories of Skyrim, I've wondered if these are technically false memories. Am I experiencing so called False Memory Syndrome? Although FSM is controversial what is beyond doubt is the extraordinary suggestibility and unreliability of human memory. I was astonished by the unreliability of memory I witnessed at first hand two years ago while on Jury service. But false memories are memories of events that never happened, but are strongly believed. On reflection I think my memories of Skyrim do not fall into this category. The events and places occurred in the virtual rather than the real, but they, and my experience of them, really happened. So if immersive video games technology has reached the point that it can create, for the gamer, memories of places and events which feel no different to memories of places and events in the real world, is this a bad thing? And, as the technology improves to make the experience more immersive, involving more senses, will we find ourselves unable to distinguish between the virtual and the real - confusing memories of one with the other? I think the answer is no. After all we each create a personal narrative - the remembered story of our lives - and I don't think it matters whether the events that make up that story happen in the virtual or the real. I think we're just as able to recall the difference between a trip to Rhyll and Rome, as between Skegness and Skyrim. And if, with advancing years or just because that's the way we are, we start to confuse these memories I don't think we're any more likely to confuse the virtual and the real, as we are the real and the real. Nor do I think the degree of immersion in the virtual matters as far as memories of being there is concerned*. After all, being in the real world is a fully immersive experience. Even if, and when, we can climb into a full-body immersive gaming rig, like those of Ernest Cline's brilliant Ready Player One, we will still only have an experience equal to that of the real world. So why should those experiences be remembered any differently to those in the real? Ok. I've persuaded myself there isn't a problem. Time for another trip to Skyrim. *There is of course another quite different concern - to do with how much more addictive the experience will become.Will we neglect the real - and ourselves, like Larry Niven's wireheads? When a robot ethics working group met nearly three years ago one of the things we fretted about was privacy. We were concerned especially about personal companion robots. Whatever their purpose, be it healthcare for the elderly or disabled, or childcare, or simply Robot and Frank style companionship we debated the inevitable privacy issues of this kind of robot. Two aspects directly impact privacy, since personal companion robots are likely to (1) collect and store data and (2) be networked. We attempted to cover both privacy and security when we drafted our Principles of Robotics. The second of our principles states: Robots should be designed and operated to comply with existing law, including privacy. Yes, sometimes the obvious does have to be stated. We are aware that the public knows that software and computers can be “hacked” by outsiders, and processes need to be developed to show that robots are secure as far as possible from such attacks. It seems our concerns were well founded. 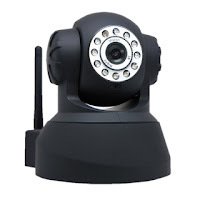 Last week a report appeared of a networked baby monitor that was apparently hacked. It was pretty distressing. The hacker was shouting abuse at the baby, chillingly using her name - it seems that he (let's assume it was a he) was able to gain access to the baby monitor's video feed and read the baby's name displayed above her bed. Even more chilling (adding to the parent's horror) the execrable hacker then turned the camera to look at them when they entered their child's room to find out what was going on. A WiFi IP Camera, aka Baby Monitor is, I contend, a teleoperated robot. The thing that makes it a robot is the motorised pan and tilt mechanism for steering the camera. So, despite password protection, Mr Gilbert's networked robot was hacked. The hack was a clear violation of both privacy and security. This particular robot, and I hazard hundreds of thousands like it, is absolutely not secure from attack. It fails our 2nd and 3rd principles. The consequences of this particular attack were, fortunately, not much more serious than giving the Gilbert's a fright they surely won't forget for some time. But for me one particularly egregious aspect of this robot hack - something that the robot ethics working group did not anticipate - was the verbal abuse hurled at baby Allyson and her parents. It is with profound dismay that I ask the question: is the first case of RoboTrolling..?